U.S. nuclear power plant outages averaged 4.6 gigawatts (GW) during the summer of 2017 (June through August), 10% lower than outages during the summer of 2016. Nuclear outages were highest in June, averaging 7.4 GW, but then averaged 3.8 GW in July and 2.6 GW in August. On August 14, nuclear outages reached their summer low, when just 0.4 GW of nuclear power plants were out. 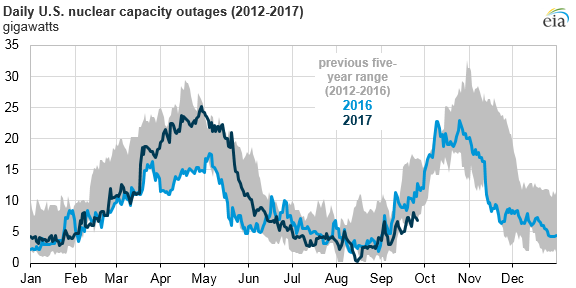 Nuclear outages are typically lowest during the summer and winter months when electricity demand is relatively high. Outages can be either scheduled or unscheduled, and they can range from a partial outage, where only some of a plant’s capacity is offline, to a full outage, where the entire plant is shut down. A scheduled shutdown of a nuclear power plant may be timed to accommodate facility inspection, refueling, or maintenance and is typically planned well in advance. On rare occasions, these scheduled outages are deferred if the reactors are needed to continue operating during times of high electricity demand. Most scheduled outages take place during the fall and spring when electricity demand is lower. Nuclear power plants typically refuel every 18 to 24 months. Other maintenance work, such as repairs and power uprates (operational changes that allow existing plants to produce more electricity), is often scheduled at the same time as refueling to minimize downtime. A forced, or unscheduled, shutdown of a nuclear power reactor is one that is not planned. These shutdowns can be the result of equipment failure, operational error, fuel shortages or limitations, or weather or environmental concerns such as a hurricane. Most unplanned outages are becaused of non-reactor core issues—including external plant conditions, such as severe weather, or non-nuclear internal plant conditions, such as those involving steam turbine and electricity generation sub-systems. Two significant forced outages in Tennessee and Texas affected the summer outage capacity in 2017. The newest U.S nuclear power plant, Watts Bar Unit 2, located in southeastern Tennessee, shut down because of a steam condenser failure on March 23, 2017, only five months after it first started producing electricity. The plant came back online on August 11. Comanche Peak Unit 2, located near Fort Worth, Texas, was forced to shut down from June 5, 2017, until August 15 to perform repairs to its main generator. Hurricane Irma led to an unscheduled outage at both of Florida’s nuclear power plants: Turkey Point and St. Lucie. The Turkey Point plant, on Florida's southeastern coast near Miami, was forced into unscheduled shutdown and reduced its output starting September 9. The St. Lucie plant, located on Florida's eastern coast, north of West Palm Beach, reduced power in advance of the hurricane-force winds. As a precaution, nuclear power reactors are required to shut down at least two hours before the onset of hurricane-force winds, usually between 70 and 75 miles per hour. Turkey Point and St. Lucie resumed 100% output on September 18 and September 14, respectively. More information on the daily operation of U.S. nuclear power plants is available through EIA's Status of Nuclear Outages page, which is largely based on data collected by the U.S. Nuclear Regulatory Commission.